Driving behind a school bus—it's every late commuter's dread. And although most drivers take extra care to come to a complete stop, watch for children, and use caution, accidents are still all too common. 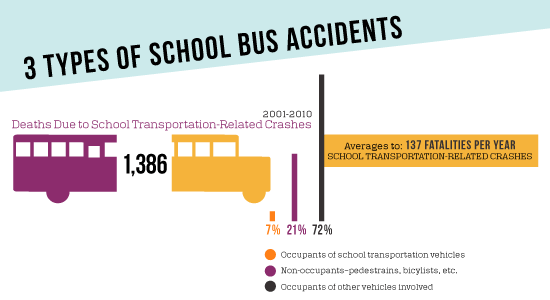 Each year, an average of 137 people are killed in school transportation-related crashes, and hundreds more are injured. When it comes to school bus safety, the safest place to be is actually on the bus. Motorists, pedestrians, and bicyclists, make up 93% of the fatalities in these types of accidents each year.1(View additional bus accident statistics). 21% were non-occupants: pedestrians, bicyclists, etc. 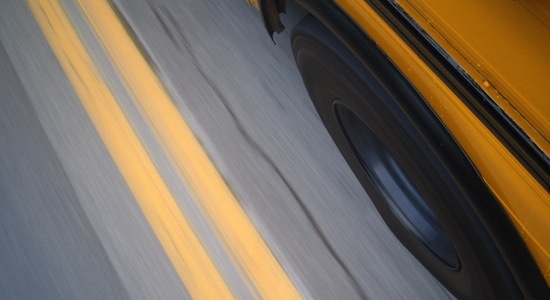 So what are the most common types of injuries resulting from school bus accidents? And how can they be prevented? Here are three back-to-school accident scenarios involving the key players: other motorists, the occupants of the school bus, and non-occupants such as pedestrians or cyclists. It's early morning and you're off to work on your daily commute. The sun is just beginning to peek over the hills and beams through the crisp fall air—directly into the eyes of sleepy drivers. 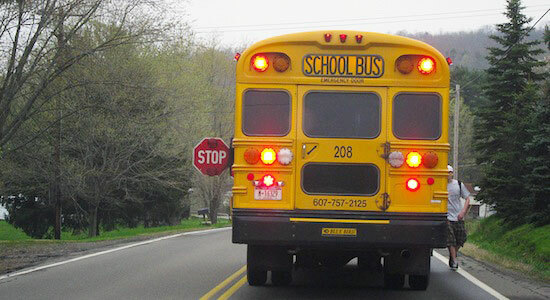 A school bus turns in front of you as you approach the next intersection. You see it turn on its flashing lights and begin to slow down to make a stop, but the driver behind you does not. After bringing your car to a complete stop behind the bus, you are suddenly rear-ended by a truck. The driver, catching up on Facebook posts on his phone, did not see the bus or your car until it was too late. Rear-end collisions are the most common type of auto accidents that we hear about at our law firm. Statistics show nearly three-fourths of fatalities involving school buses are the occupants of the other vehicles involved.1 Injuries from accidents like these can range dramatically, with many conditions not making themselves known until months down the road. Whiplash, back and neck injuries, broken bones and fractures, chronic pain, a herniated disc, or serious head injuries can all arise from rear-end collisions. View a complete list of common injuries from car accidents. Could range from personal injury, property damage, or—in the worst-case scenario—wrongful death. It's back-to-school season once again, and you're headed on your normal route around the block for your AM dog walk. 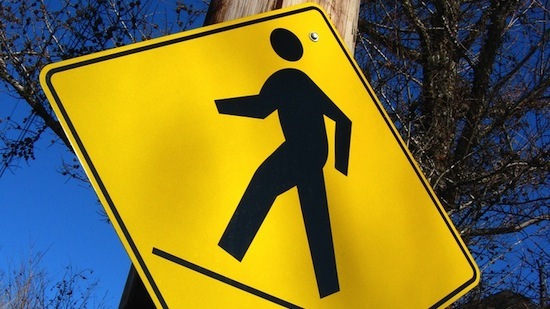 You arrive at a crosswalk, look both ways, and proceed with caution to the other side. A school bus seems to come out of nowhere, rolling right through the stop sign. The driver does not see you and, unfortunately, there is not enough time to move out of the way before getting hit. Pedestrians account for the highest number of school bus-related fatalities, with an average of 17 pedestrian deaths occurring each year. Most of these, however, don't happen when the school bus is swerving, changing lanes, or negotiating a curve, but simply when the bus is driving straight ahead.2 These types of accidents, if not fatal, can cause lifelong injuries ranging from broken bones to paralysis. During your routine mechanical check, you notice that the tread has completely worn away on the school bus' tires. Your boss reassures you that it is not dangerous, and—with reservations—you start off on your morning bus route. Slick roads from last night's rain make safely navigating the turns on your route extra difficult. When a driver suddenly stops in front of you, you find yourself unable to stop the bus in time and are forced to swerve into a ditch. As a result you, along with a number of students on your bus suffer injuries ranging from bumps and bruises to serious head and neck injuries. Although only 7% of school transportation-related fatalities are occupants of the bus involved, accidents such as these do happen. Although many accidents are unavoidable, there are steps you can take to protect yourself and your children this school year. 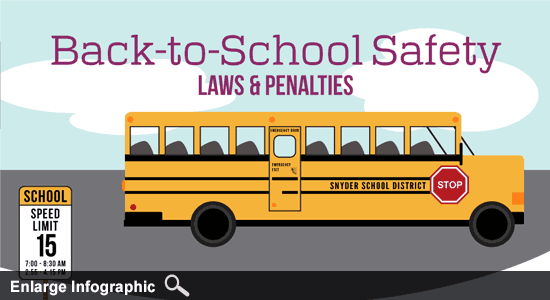 Understand the school bus stopping laws in Your State. View PA laws here. Review these bus stop safety tips with your family. Whether walking, driving, or cycling, always maintain a safe distance from school buses. Do any of these scenarios sound familiar? If you have serious injuries resulting from a school bus accident please contact us today for a free consultation of your case.